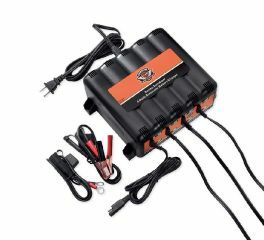 This fully-automatic Harley-Davidson® Weatherproof Dual-Mode Battery Tender is perfect for short- or long-term motorcycle battery charging needs. 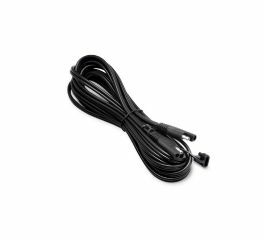 The wiring harness utilizes a plug connector that is compatible with all Harley-Davidson® Battery Chargers equipped with black connectors. Is your motorcycle parking spot too far from your garage electrical outlet? 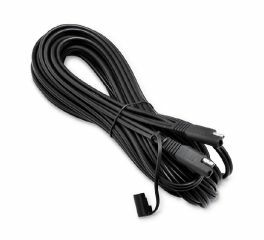 Extend the reach of your Harley-Davidson® Battery Charger with this convenient Extension Lead. Keep all your bikes fully charged and ready to ride. 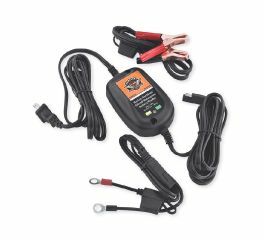 Harley-Davidson® Battery Charger Stations are designed to fully charge and maintain lead-acid motorcycle batteries, and maintain them at proper voltage. Professional charging performance in a compact package. 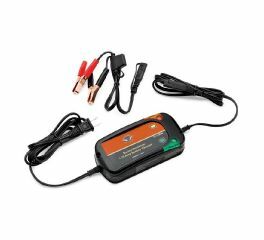 With a typical recharge time of 1 to 2 hours, this battery charger features advanced solid-state circuitry that constantly monitors the batterys charge and maintains the voltage without overcharging. 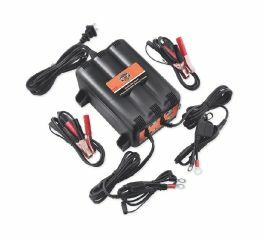 Properly charge and maintain all H-D® 12-volt batteries. The advanced solid-state circuitry constantly monitors the battery’s charge, and manages the voltage without overcharging. Professional charging performance in a compact package. 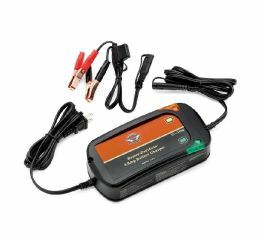 With a typical recharge time of 1-2 hours, this battery charger features advanced solid-state circuitry that constantly monitors the battery’s charge and maintains the voltage without overcharging. 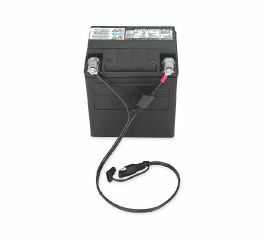 Typical Recharge Time: 8-12 hours This waterproof, fully-automatic charger is ideal for both short term and seasonal storage, even if moisture sneaks into your storage area. The three-step charging system constantly monitors battery voltage to bring the battery up to full charge and switches to float mode to maintain the charge over extended periods of time. The vibration- and shock-resistant Battery Tender is reverse polarity protected and spark proof, even when the leads touch. The Tender features 2 front panel LED lamps that indicate the battery's state of charge. Accepts worldwide voltage 100 to 240 VAC @ 50 to 60 Hz. Maximum charge rate of 800mA. 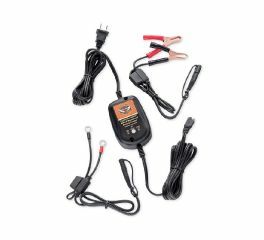 Kit includes a quick-disconnect 7.5 Amp fused Battery Charging Harness with ring terminals that can attach to the battery screw terminals for easy connection, and a 7.5 Amp fused alligator clip charging harness.